5. Give without worrying about your imperfections or limitations. “Freely you have received; freely give” (Matt. 10:8 NIV). You don’t have to be a saint, genius, or the next winner of a TV talent program to bring joy to others with your gifts. Let’s face it, the vast majority of us will never reach those levels! Give without restraint, and it will free you to be more than you ever imagined. Don’t get discouraged by what you see as your limitations. My mother couldn’t drive in her later years, but she used her talent for knitting to make sweaters and other items for charity. Your gifts are only as great as you allow them to be. If you feel the need, read books or take a class to improve your skills. But it is by using our gifts and seeing the happiness they bring that we gain the greatest confidence. Our skills will grow as we continue to share them. We will also gain valuable feedback about where we are succeeding and how we can keep improving. Jesus told a parable about three servants who were entrusted by their master with varying sums of money (called “talents”), each according to his ability, before he left on a journey. The first two servants invested the money wisely and doubled the amount they had been given. But the third servant, because he was afraid of losing his master’s money and angering him, buried it in the ground. When the master returned, he praised the first two servants for their ingenuity and entrusted them with greater authority and responsibilities. But when the third servant returned the money exactly as it had been given, with the excuse that he had been afraid to do anything else with it, the master was angry. He took the money from the third servant and gave it to the first servant, who had returned to the master the greatest amount of money. God wants us to “invest” in the talents he has given us, and if we do, He will increase them and reward us with greater opportunities and deeper fulfillment. But if we “bury” our talents out of laziness, fear, or feelings of inadequacy, this is contrary to God’s plan. It is not showing proper appreciation and gratitude for the gifts our Creator has entrusted to us. Hoarding our gifts gives nothing back to the world, or to God from whom we have received so much. When we stop giving, we stop growing. Although we fear other people’s criticism and rejection, we usually are our own worst critic. We are eager to answer God’s call to use our gifts. Then that little negative voice inside us undermines our confidence, reminding us of our limitations and everything that can possibly go wrong. “You can’t do that!” it taunts. And that’s true: We can’t do it, but God can do it through us! If we reach out to God in faith, He will lift us up to our true potential. 6. Remember that sharing our gifts and earning money are not mutually exclusive! What if you are unhappy in your job, or unemployed and trying to find a job, or are in need of additional income? Usually our talents will lie in the areas for which we have a real passion. Many times, these passions point to our life’s true purpose. A career change or an entrepreneurial opportunity will sometimes develop from volunteer work that opened new doors for us. If you are unhappy in your present job, finding ways to do the things you love and for which you have an innate gift can help you feel happier and more fulfilled, whether or not you ever earn any money from it. If you are unemployed and job hunting, share your gifts and abilities in the meantime. Offering your talents as a volunteer is an excellent way to hone your skills, make new contacts, and ward off the depression and discouragement that can come with being unemployed and searching for a new position. It also is a way to “plant seeds” that will demonstrate your faith and grow into future blessings. 7. Make use of the present time and don’t procrastinate. “So then, if we do not do the good we know we should do, we are guilty of sin” (Jas. 4:17). The excuses are many: “I’m too busy right now,” “I’m not ready,” “I’ll wait until I retire,” “Maybe next year,” “I’m not good enough yet.” But our time on earth is limited. We don’t know if we’ll have tomorrow. By procrastinating, we can miss precious opportunities and later regret it. Future possibilities grow out of what we do in the present. Don’t wait until all the conditions of your life are ideal or your gift is “perfect.” Guess what? This will never happen! Do it now! As we freely share what we have been given, our power to help others and do God’s work multiplies. Using our gifts is an investment in God’s Kingdom. This is like buying stock that can only go up. Be a star in God’s talent show! Lavishly spending our gifts brings happiness to others as well as ourselves. It fulfills our responsibility to make the world a better place. What are your particular gifts and how have you used them? I would love to hear your own thoughts and experiences in the Comment section below. 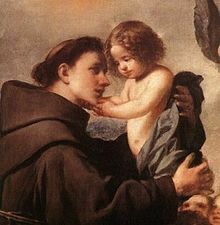 Today, more than 750 years after his death, Anthony of Padua is one of the most popular and powerful saints of the Church, the many miracles attributed to him over the centuries earning him the title of “The Wonder-Working Saint.” His Feast Day is June 13th. The 1990’s were for me a time of spiritual searching. I had always believed in God and had always been able to speak to Him as a Friend and Father. However, at this time I had many unresolved questions about destiny, my purpose, life in general. I was at the time of life that many of us eventually encounter, when we search for deeper meaning and purpose in our existence. Cardinal Mercier went on to say that if you said the prayer daily, you would receive the serenity, consolation, grace and strength of the Holy Spirit, even in the midst of trials. I didn’t know much at that time about the Holy Spirit, except for what most Christians know: He is the Third Person of the Trinity, He came to the Apostles at Pentecost, and at Confirmation He infuses us with His gifts of wisdom, understanding, counsel, knowledge, fortitude, piety, and fear of the Lord (awe). But all of these were only facts I had learned in Catechism class, not truths that I felt or understood on a deep, personal level. However, I decided to say the prayer every day and see what happened. What gradually did occur when I put my trust in the Holy Spirit transformed my life and my relationship with God in ways I never imagined. I didn’t get all the answers to every question I had, but insights started to emerge – not the faltering human attempts at reason that the conscious mind produces, but serene, gracious, perfectly wise and loving answers that I knew were coming from a Source far greater than anything in my own power. I knew with deepest certainty that they were the true answers, because they reflected only the highest values and motives that I knew to be Truth, even at times when my human, conscious mind had been thinking just the opposite or had no answers at all. Other changes began occurring. Because of the loving wisdom I was now perceiving in my life, God’s love became truly personal to me, a tangible thing, not merely the abstract concept I had grasped only partially before, which had consisted of thoughts like, “Yeah, I know God loves me. He has to love me, since God is Love and He created me.” Now God’s love and guidance became a real, vibrant force, not an idea or theory. Now when I heard Scripture being read or a sermon being given, I was grasping them with an understanding that really related them to my own life. I became aware that I was surrounded by love, protection and guidance from unseen sources that were as real as anything that existed in the material world – actually, more real! The gifts and fruits of the Holy Spirit took on meaning as powerful graces that were alive and working in my life and were mine for the asking, not just words to be memorized. I entrusted my life and my future to the Holy Spirit’s guidance, and asked Him to bless me with the gifts necessary to do whatever work God had planned for me. At this time, I was also doing a lot of dream work, studying about dreams and keeping a dream journal. Many times, I would pray and meditate upon a question at bedtime and see what insights I might receive in my dreams. I was a vivid dreamer, and would often have detailed dreams full of personal symbolism and meaning, which I faithfully recorded and worked on interpreting (more about dreams in a future blog article)! In the dream, I am in a building that resembled an office building. I don’t know where or why I am there. As I walk through this building, I pass a man who is looking at me with a big, friendly smile. I don’t recognize him as anyone I know. I am wondering who he is. He certainly seems to know me, since he is smiling at me in such a familiar way. So I ask a woman nearby who that man is. She replies, “Oh, that’s the Holy Spirit!” I am thrilled and awed to be seeing Him, yet I’m surprised that he looks like a mortal, human man. I don’t recall now exactly what He looked like, but the thing that stands out in my memory was that radiant smile He was directing at me. He looked like an ordinary person – no fanfare, no great rays of light beaming from Him, no resplendent garments, nothing “biblical” in the least – just an ordinary man with a beautiful smile. In the next scene of the dream, I am starting a new job in that same office building, and I am introduced to the group of men for whom I will be working. They all look like the man who had been identified to me as the Holy Spirit! I remark to someone standing nearby, “Well, since they all resemble the Holy Spirit, at least I’ll get a chance to see what it’s like to work for Him! I’ll see what kind of a boss He is!” There the dream ended. My Truth is in everything you do with high motives. These beautiful words made clear to me the meaning of the dream: The Holy Spirit had looked like an “ordinary person” because He wants me to know that God is within every person we meet. We don’t always recognize Him — as I didn’t recognize the man in my dream as being the Holy Spirit — but He knows us intimately and loves us with an unsurpassed love, symbolized by the man’s bright, beautiful, loving smile. As Pentecost Sunday approaches, I share this dream as an encouragement to anyone who has not yet discovered what a wonderful Friend (and “Boss”) the Holy Spirit can be. I urge you to seek Him out, ask Him to manifest in your life and draw you closer to Him. He will enlighten and guide You and share His marvelous gifts with you, if you will only open up and let His light in. As the dream symbolized, by serving our fellow humans and living in the light of the Holy Spirit, we will find true happiness and peace, and we will know God. Part One summarized Bernadette’s life, highlighting the apparitions of Our Lady of Lourdes to Bernadette in 1858 and the miraculous healing spring which Bernadette unearthed at Our Lady’s direction. We took a look at some of her virtues and struggles. In Part Two, we continue to explore Bernadette’s characteristics and the many challenges she faced throughout her life. Bernadette had a quick wit and a merry, sometimes mischievous, personality. At the convent, she often entertained the other sisters during recreation with her amusing stories and talent for mimicry. But her wit was always good-natured, never malicious or hurtful. Her sense of humor no doubt kept her from taking herself too seriously and becoming overwhelmed by the extremes of adulation and ridicule that came with being a public figure. Bernadette loved nursing the sick and excelled at it. “She always had the kind word that relaxed, reassured, and got them to take their medicine,” said one of her patients. In November 1872 she was made Head Infirmarian at Nevers, a position she held until October 1873. Friendly and affectionate, she was a compassionate and understanding listener, who always had an encouraging word for the troubled or homesick novices her superiors often sent to her. Deluged with endless prayer petitions, she always agreed, on one condition: “I also need prayers. I don’t give something for nothing!” She was faithful to the Virgin’s message of prayer and penance given at Lourdes, and offered her prayers and sacrifices to Our Lord each day for the conversion of one sinner. Although vivacious and talkative by nature, when it came spiritual matters, Bernadette found God in the practice of recollection. She had difficulty with formal meditation, but loved the Congregation’s rule of silence during specified times and would break it only for the most urgent reasons. Most of the time, however, Bernadette spoke of the Lady of Lourdes only when asked, and then her answers were brief, objective and reserved. Over time, Bernadette’s memory of the apparitions grew dimmer, and she could no longer see a clear image in her mind’s eye. But she didn’t need a picture, because it was forever engraved in her heart. A considerable amount has been written, much of it exaggerated, about the complex relationship between Bernadette and her superiors at Nevers, particularly Mother Marie-Therese Vauzou. It’s true, however, that this situation was one of Bernadette’s heaviest crosses. Mother Vauzou, despite her initial excitement at having the visionary of Lourdes join the Order, was often cold and severe with Bernadette, subjecting her to frequent humiliation and testing her almost beyond endurance. One likely explanation was the problem presented by the entrance of so extraordinary a figure as Bernadette into the Order. The Sisters recognized the challenge of trying to treat her like any ordinary novice. Most likely, in their zeal to protect Bernadette’s soul as well as the dignity and integrity of the Congregation, her superiors sometimes carried their efforts too far. Another factor was the basic difference in personality between Mother Vauzou and Bernadette. Mother Vauzou wanted the sisters in her charge to openly confide in her, and hoped to be privy to the innermost thoughts and soul-stirrings of the chosen one of Mary. Bernadette’s disinclination to analyze or verbalize about the spiritual life must have greatly frustrated and disappointed Mother Vauzou. Moreover, being somewhat of a snob regarding class distinctions, Mother Vauzou was probably resentful and jealous of the graces and attention that had been showered upon Bernadette, a mere peasant girl. For Bernadette’s part, although she felt somewhat reserved and uneasy around Mother Vauzou, she loved and admired her, and suffered greatly when she didn’t receive the same affection as the other nuns did. From the age of six, Bernadette was plagued with various physical illnesses, including stomach and spleen ailments and asthma. At Nevers, she developed tuberculosis of the bone. An enormous tumor on her right knee caused her excruciating pain, and she suffered attacks of coughing so severe they nearly choked her. Eventually, disease ravaged her entire system. Agonizing sores erupted all over her body, including abscesses in her ears that affected her hearing. Sister Marthe once found Bernadette crying and inquired if she was feeling sick. Bernadette replied, “If you only knew everything that’s going on inside me…Pray for me!” At the heart of this inner torment were her deeply disturbing, though unwarranted, doubts about the apparitions and the fear that she “might have been mistaken” about them. Author’s Note: I have loved St Bernadette and the story of her life and the apparitions of Our Lady of Lourdes since I was a child and first saw the beautiful movie, “The Song of Bernadette,” based on the best-selling novel by Franz Werfel. Although the novel and movie contain some fictionalized or romanticized elements, they are based on historical fact and give a wonderful overall picture of the marvelous events at Lourdes and the life of St. Bernadette Soubirous. I highly recommend both the book and the movie. Jennifer Jones gives a glowing and poignant portrayal of Bernadette, and the movie is worth watching for her performance alone, which won her the Academy Award for Best Actress in 1943. It’s hard to watch the ending without being moved to tears. Interestingly, Franz Werfel was a German-speaking Jewish novelist, playwright and poet, born in Prague, Czechoslavakia. While escaping from the Nazis during WWII, Franz and his wife, Alma, were given refuge in Lourdes, France, where Franz heard the story of Bernadette Soubirous and the Lady. Impressed and gratified by the assistance and kindness he received from the people of Lourdes and the staff at the famous Lourdes shrine, he made a vow to write about Bernadette once he was safely settled. He and Alma eventually journeyed to California, where they lived for the rest of his life. My own two-part article on this blog was based on extensive research into the life of Bernadette Soubirous, not on the Werfel novel, and I have not strayed from the facts. I mention the novel and the movie because they first kindled in me a love for Bernadette and Our Lady of Lourdes, and because I strongly feel that both are masterpieces well worth reading and watching, as I have done many times. Bernadette, the first child of the miller François and his wife, Louise, spent the first 10 years of her life at the Boly Mill, which her father operated. Then, in 1854, the business fell on hard times. The family, which now had grown to six, was evicted and forced to move into the dungeon room of a former prison, considered too damp and unhealthy to house criminals any longer. Despite their extreme poverty and deplorable living conditions, the Soubirous were devout and close-knit family. Spirited, fun-loving Bernadette was petite and pretty, with a round face, beautiful chestnut hair and gentle, velvety dark-brown eyes. As the eldest daughter, she cheerfully and efficiently performed all the traditional family duties expected of her. Although of delicate health, she was to all outward appearances an ordinary, unremarkable young girl. But on February 11, 1858, when Bernadette was 14, she had an experience that would change her life beyond anyone’s wildest dreams. While gathering wood in the grotto at Massabielle, she saw an indescribably beautiful young lady dressed in a white veil and a white gown tied with a blue sash, standing in a niche above her. The Lady had a rosary on her arm and golden roses on her bare feet. She smiled at Bernadette and held out her arms in welcome. The astonished girl fell to her knees, instinctively reached for her rosary, and began to pray. For many weeks, Bernadette had no idea who the Lady was; she referred to her simply as “Aquero” (“that one”). When, at the urging of her companions, Bernadette offered the Lady pen and paper to write her name, the Lady laughed gently and replied, “It is not necessary.” On February 25, at the Lady’s direction, Bernadette unearthed an underground spring, which ever since has been a miraculous source of spiritual and physical healing. “Aquero” finally revealed her identity during the 16th apparition on March 25, feast of the Annunciation. Folding her hands and raising her eyes to heaven, she said: “Que soy era Immaculada Counchetsiou (I am the Immaculate Conception).” So as not to forget, Bernadette silently repeated the unfamiliar words all the way to the rectory, where she dutifully reported them to the pastor, Fr. Peyramale. It was only after the priest explained the meaning of the words to her that Bernadette finally knew that “Aquero” was the Blessed Virgin Mary. In July 1866, Bernadette left Lourdes forever to join the order of the Sisters of Charity at Nevers, where she took the name Sr. Marie-Bernarde and served as Infirmarian and Sacristan. Her health continue to decline steadily, and she died on April 16, 1879, at the age of 35. She was beatified on June 14, 1925 and canonized on December 8, 1933. She is buried at the Convent of St. Gildard at Nevers. Her body remains mostly incorrupt to this day. Bernadette did not perform heroic deeds or suffer martyrdom; she died quietly in a French convent after a long and painful illness. She did not seek out suffering or extreme mortification, but accepted with grace and courage the many trials, pain, and humiliations life handed her. She has been compared with St. Therese of Lisieux, who was 6½ years old when Bernadette died in 1879. In actuality, Bernadette was living the “Little Way” years before Therese was born. Yet, unlike Therese, who left such prolific spiritual writings that she was declared a Doctor of the Church, Bernadette has been called “the most secretive of all the saints,” because she was not given to deeply analytical, sentimental, or effusive discourses on spiritual matters. She lived her faith naturally and instinctively. In this simplicity lies Bernadette’s appeal. She is a model we can emulate, someone whose common-sense spirituality is down-to-earth and approachable. In fact, Bernadette herself insisted on learning about the faults and spiritual trials of the saints, which humanized them and inspired her to overcome her own shortcomings. Similarly, in this series we will explore the virtues and struggles of this charmingly simple, humble saint. For Bernadette, poverty was a means of preserving humility. “I want to stay poor,” she told a journalist who was laying out before her the prospect of wealth. She repeatedly turned down gifts of money that well-meaning people tried to press on her and her family. “It burns me!” she would say. Even in the convent, she received many visitors who wanted to see her and hear about her extraordinary experiences. These visits became a great trial to Bernadette, who wanted nothing more than to remain hidden and be just an ordinary nun. She did, however, dutifully see visitors when directed to do so by her superiors. Obedience did not come easily to Bernadette, because of her quick temper, strong will, and exuberant personality. She found it hard to adjust to the strict and confining life of the convent, and sometimes reacted spontaneously despite her best efforts to conform. She would get discouraged, but this only caused her to depend more totally on God’s grace. “How I need the help of God!” she would exclaim. Perhaps the hardest test of Bernadette’s obedience was the strict order of her superiors at Nevers not to speak to her fellow nuns about the visions of Lourdes. She naturally would have longed to share her extraordinary experience, and the other sisters were bursting with curiosity. Yet, with unflinching obedience, she kept silent about it. The voice said, “Have a medal struck after this model. All who wear it will receive great graces; they should wear it around the neck….” The apparition reversed, and Catherine saw a large M surmounted by a bar and a cross, with the Hearts of Jesus and Mary beneath it, one crowned with thorns, the other pierced by a sword (symbolic of the prophecy of Simeon, when he told Mary, “a sword shall pierce your own heart, so that the thoughts of many hearts will be revealed.” Luke 2:35). Twelve stars encircled the whole thing. The vision then faded, but would be repeated five more times over the next year. Catherine told Fr. Aladel about the latest apparitions and the request to have a medal struck. As with her other visions, he did not accord it much importance. Each time the vision was repeated, poor Catherine was compelled once again to approach Fr. Aladel about it. These were extremely unpleasant encounters for Catherine, often involving verbal battles between her and Fr. Aladel. The other Sisters would see Catherine approach the confessional trembling with fear, then hear the sound of raised voices issuing from within. Although Catherine was never disobedient or rebellious, and would cease the discussion at Fr. Aladel’s order, she was not to be dissuaded from the mission she believed God had entrusted to her. While honoring her vow of obedience, she nonetheless possessed a strong will and a spirited tongue, and doggedly pursued her mission. There is no doubt that, as Our Lady had warned, Catherine suffered much during this period, even to the extent of telling the Virgin that she “had better appear to someone else, since no one will believe me.” Only Our Lady’s promise of God’s grace sustained Catherine and made it possible for her to persevere. In fairness to Fr. Aladel, his was not an easy task, either. He needed to determine if Sister Catherine’s visions were genuine and whether it would be prudent to act on them. But eventually, as he came to know Catherine better, he realized that by her very nature it was unlikely that she was inventing it all. He knew that she was good and pious, and he did not doubt the sincerity of her belief that she had seen these things. He also realized that of herself she did not possess the intellectual ability nor the imagination to fabricate such a story with all its lavish detail. Then, too, was the fact that her reported prophecies had indeed come true. Furthermore, he had given his promise to Catherine early on that her identity not be revealed, which placed all the responsibility for carrying out heaven’s orders on his shoulders alone. Meanwhile, the end of Catherine’s novitiate was fast approaching, when she could possibly be assigned to a far-away post. Somehow, Fr. Aladel managed to use his influence to ensure that Catherine was assigned to the Hospice d’Enghien at Reuilly, where he was the regular confessor. This, of course, was necessary because of his role as Catherine’s spiritual advisor in the matter of her visions. The Hospice had been founded as a retirement home for the old men who in earlier years had served the royal family. Sr. Catherine’s duty would now be to care for these aged residents. No doubt it was these words reported back to Fr. Aladel that finally spurred him to action. His love for Mary and his fear of angering her overcame the lingering doubts he had about Catherine’s visions. Indeed, Our Lady seemed to have great confidence in him, as he also would later be spiritual advisor to Sr. Justine Bisqueyburu, to whom the Green Scapular was manifested in 1840, and would be responsible for its production and distribution. In January 1832, his good friend, Fr. Etienne, had an appointment with Archbishop de Quelen and asked Fr. Aladel to accompany him. After Fr. Etienne’s meeting, Fr. Aladel took this opportunity to tell the Archbishop about the visions and Our Lady’s request for a medal. After much careful questioning, the Archbishop, who was especially devoted to the Immaculate Conception, consented. On June 30, 1832, the first 2,000 Medals of the Immaculate Conception were delivered. Catherine, upon receiving her share of medals, said, “Now it must be propagated!” She was to keep a few of these first Medals until the end of her life (one of them can be seen at the Miraculous Medal Art Museum in Germantown, PA). Catherine’s great mission was accomplished; and the ecstasy of the heavenly visions, as well as the despair and frustration of trying to convince Fr. Aladel to act on them, was over. Now Catherine would embark on the final, and longest, phase of her earthly journey: the hidden life of obscurity as she settled into the ordinary routine that was to be her destiny for 46 years.